The Wire Fox Terrier has been used for many hunting activities, the most common being hunting foxes in England. This breed would harass the fox out of his hole by biting and snapping. The Wire Fox Terrier has also been used for ratting on occasion and has done exceptionally well. This breed can also excel in many different activities such as, hunting, watch dogging, as an alarm dog, agility, tracking, and also performing tricks which he is known for. Being a terrier, this breed is very lively and energetic making him a joy to be around. The Wire Fox Terrier will always liven up the room. A great sense of humor and a very loving companion, this breed can also be wary of strangers so proper socialization is a must. The Wire Fox Terrier has a very fun loving and energetic personality making him very popular among families, but the owner should always do their research to be sure that this lively dog is right for their environment and lifestyle. The Wire Fox Terrier is very friendly and alert. This breed does make a good alert dog, but does not do well as a guard dog. The Wire Fox Terrier can do well around children, but if around smaller children, he should always be supervised as this breed has the tendency to snap when irritated or pestered. The Wire Fox Terrier generally doesn't do well around other pets and should never be trusted around smaller and more passive animals. If socialized and trained properly at an early age, this breed can do well around other dogs and lose the tendency to be combative and aggressive towards them. The Wire Fox Terrier does require much grooming, however brushing is necessary. Stripping of the coat is required for show dogs, however can be done less frequently if not used for these purposes. Hand plucking of the coat may be necessary to remove dead hairs but should only be performed by an experienced groomer. The Wire Fox Terrier has a much longer beard along his muzzle which should be brushed and cleaned every other day to prevent caking, matting, and dirt. Washing with a mild soap and brushing with a fine-toothed comb will prevent this. 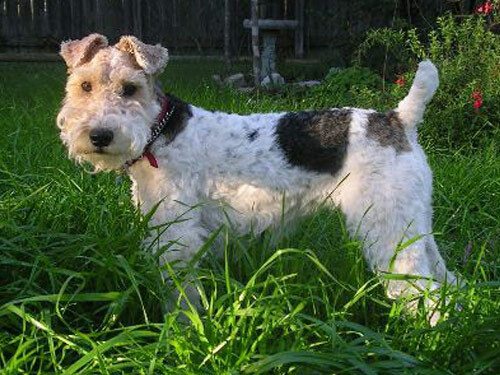 The Wire Fox Terrier has a broken coat giving the coat a shaggy type appearance. The hair of this breed should twist, and always have longer hair on the muzzle, giving him a beard. The coat of this breed should never be soft or silky and should always remain harsh and wiry. The beard of this breed is the most noticeable, and most likely requires the most maintenance. The Wire Fox Terrier is very lively and can be independent making training at an early age very important. This breed loses interest quickly and should have a firm and consistent handler. Making training a game and fun will be sure to keep this dogs interest. The Wire Fox Terrier should have an experienced handler, as they can be very stubborn and willful. If the proper techniques are not performed, this breed will be very difficult to train and become somewhat of a tyrant. The Wire Fox Terrier loves exercise and is very active. This breed can do well without a yard, however due to the energy, at least a small yard would be best. This breed does remarkably well running along side a bike, and loves long jogs with his owner. The Wire Fox Terrier does best in a home with a fenced in yard as they love to run and chase, however the fence should always be reinforced in some way and should always be at least 6 feet in height to prevent escape.